Our latest restoration, a c.1970 Beckmeter M60 is now completed. 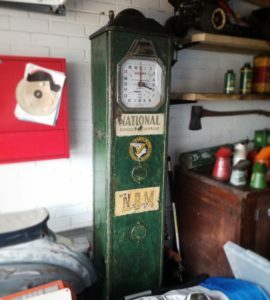 Resplendant in its correct original Shell UK colour scheme with period decals, re-wired (PAT tested), new hose & new glass globe. Complete with its internals, professionally restored in house by us to our usual high standard and ready to find a new home. A great size pump. See ‘Pumps’ page for more details. We’ve been making the most of this weeks weather and getting some more panels into colour. 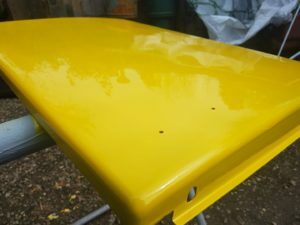 The first coats of Shell yellow and red have been applied to our Beckmeter M60 pump panels, seen here drying in the spring sunshine, these will be flatted off and more coats applied before a satisfactory finish is reached, but a good start for the first coat, straight from the gun! Another pump soon to be complete and ready for sale! We are delighted to have been able to bring home this early electric Avery Hardoll 298 Pump this week in its original National Benzole logos. 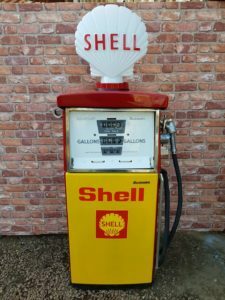 One of the first pumps we ever purchased! It served from new outside a cycle shop in Surbiton and has had a varied life since going into preservation. We have a few little jobs to do and it’ll be ready for display again. 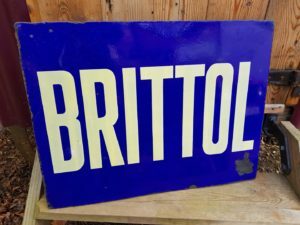 This stunning and rarely seen Brittol fuel/oil double sided enamel sign sold to a top UK collector this week within just 10 minutes of posting online! We love the hunt and finding great homes for our pieces where they’ll continue to be enjoyed for years to come! 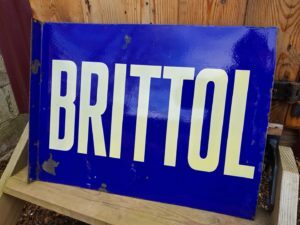 We were recently contacted by a client looking to sell their collecton of motoring memorabilia in order to move in a new direction. We were able to purchase a large amount of items which we are now in the process of sorting and is all due to be uploaded to the website for sale shortly. Tins, pourers, signs and globes, from great budget friendly shelf fillers to real gems, something for everyone. It’s not everyday that we get to find great pieces in one place and even buy back some familiar old friends! 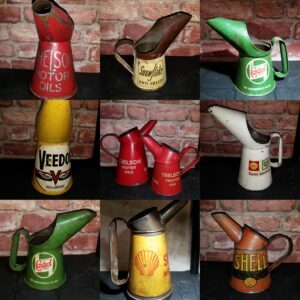 Attached is a small selection of the purchased oil pourers for you to perouse. Did you see our Avery Hardoll pump at the NEC? Completed as an example of what we could build for you. Either as a traditional brand or customised to match your car or advertise your business or brand, as you see here finished in our own special livery. Restored to a high standard and features include 24ct gold leaf sign writing! Please contact us to talk about restoration options. Our latest client commission restoration is now complete and was delivered to a delighted customer last week. We thoroughly enjoyed working on this one, being one of the first pumps we purchased, it has stayed in our collection until earlier this year when the decision was made to sell it. The customers choice of Gulf racing colours suites this Gilbarco Salesmaker pump perfectly. 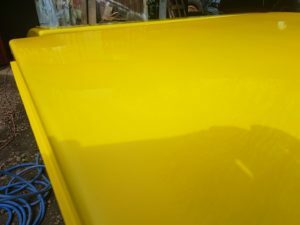 If you are considering a commission restoration then feel free to make contact to discuss options. We were honoured to be able to supply a pair of glass globes to Themed Garages for the Goodwood Revival 2018. A last minute set change required two pumps to be re-liveried and globes sourced. These glass reproduction globes had previous names removed, were delivered and then painted by on site sign writers just 48 hours before the gates opened! They looks stunning. It was a pleasure for us to be of assistance. As always a fantastic weekend and we look forward to next years event. After a hectic few months with our move we are slowly getting back into the swing of things! We have some fantastic new stock coming in at the moment, some super rare pieces and several project pumps, all has been sourced from individual collectors looking to downsize after 50+ years of collecting. Items will be added shortly to the website. We are also scaling back our own personal collection with lots of collectable tins now available. Keep checking back for updates to the stock pages to see whats new! We have just started a restoration for a client on a Gilbarco salesmaker pump, to be finished in the iconic Gulf blue/orange racing colours. Pictures due soon!